The French anti-GMO activist group, the Faucheurs Volontaires, was in the news recently after they stealthily scythed genetically modified grapevines in the Colmar region of France this Summer. The Faucheurs targeted the Colmar vineyard in response to the use of chemicals in order to treat presence of the grapevine fanleaf virus that was attacking the grapes. The government, however, “firmly” condemned the act in a press release issued on August 16 saying that they “insist upon the necessity of scientists to be able to work in serenity, especially given that the modes of testing the GMOs were the product of a large consensus.” The authors of the press release, which included the Minister of Research and Higher Education Valérie Pécresse and the Minister of Food, Nutrition, and Fishing Bruno Le Maire vowed to “continue to support research in biotechnology, which is indispensable for the future of agriculture”. Les Faucheurs Volontaires must be used to these mixed reactions and accept them along with the legal fees and punishments that come along with their special brand of agricultural activism. Fines and prison sentences are often the aftermath of their protests, which have taken place in French regions such as Nonette, Avelin and Poinville. The Faucheurs Volontaires represent a movement to stop the control and inotoxication of our food chain and, regardless of fines, prison time and governmental condemnation, we all reap the benefits of their actions and their activism. 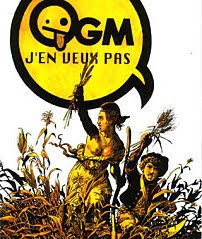 This was recognized by the courts in Orléans and later in Versailles which acknowledged in 2005 that the Faucheurs' scything of a crop of Monsanto's transgenic corn was an act that was motivated by a “necessary state” of concern for the detrimental affects of GMOs. If you live in France, you can support the Faucheurs Volontaires by buying their wine (see biocoop entry, Day 4) you can also support by donating money in order to defray legal fees, or you can sign this petition. The least you can do is buy some organic booze and raise your glass to some of France's favorite saboteurs: the Faucheurs.